This month's feature project combines effective use of translucent daylighting with other energy-efficient strategies, while also offering students a bright and welcoming environment in which to learn. The new Taylorsville Elementary School in Taylorsville, Kentucky, designed by Sherman Carter Barnhart Architects, houses both intermediate and primary students and features numerous extended learning areas for learning outside the "traditional" classroom, a computer lab that doubles as a STEM lab, and an outdoor learning area. The front of the school shines with it's effective use of translucent daylighting. Guardian 275® wall systems were used both near the front entryway and throughout the cafeteria/gymnasium space. Translucent panel systems can be a great way to mark entry points to a building, as their translucent properties can act like a beacon when back-lit in the evening hours. 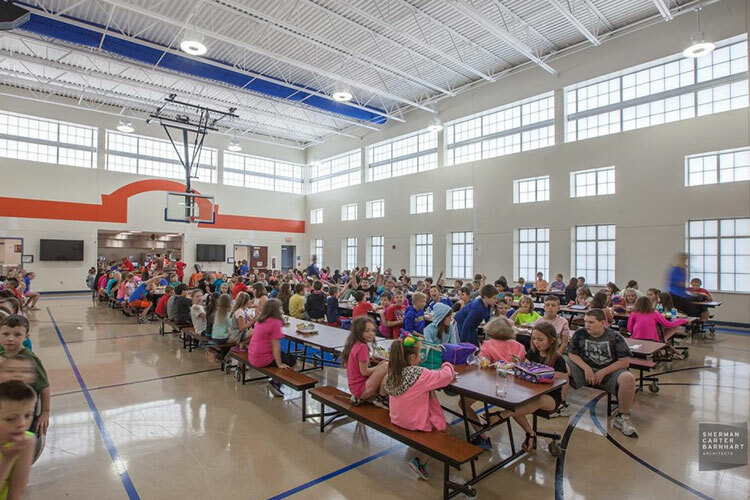 And cafeteria and athletic facility spaces benefit from the light diffusing properties of translucent panels as they eliminate uncomfortable hot-spots and glare caused by traditional glass glazing. Translucent panels can also be beneficial for school facilities as they block a direct line of sight into the facility, allowing for a greater level of privacy. Perhaps best of all, translucent panel systems like Guardian 275® can also be beneficial for enhancing building performance. Beyond the translucent panel systems used in the facility, the Taylorsville Elementary School also features insulated concrete forms (ICF), a geothermal mechanical system, and LED lighting. According to Sherman Carter Barnhart Architects, all of these strategies will improve the energy efficiency level of Taylorsville Elementary to reach Net Zero Achievable, operating at less than 25 EUI/SF/YR.